Photo by @topgold using Sony K800i. I PASS THROUGH County Laois at least twice a month and today I've discovered more about the area than in my previous 15 years in Ireland. I can thank List.ly for part of that. 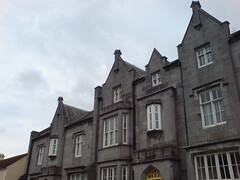 The List.ly creation shows places recommended by venue managers, community volunteers and heritage experts who operate many of the places I've passed by while driving between Dublin and County Tipperary. My kids would enjoy many of the things I've heard discussed in a County Laois working group and I think the collaborative list elegantly captures these ideas. I talked about doing this kind of project as I stood under the North Pole today. I'm delighted my plans have unfolded as brilliantly as I had hoped. BACK IN THE EARLY 80S, I occasionally crossed the Atlantic Ocean 10 times every October. This century, I'm crossing once every five years. I miss the oceanic travel but know I will never enjoy the legroom and service I once got at the pointy end of the aircraft. My bulkhead seat today on a Boeing 777 was as cold as some copilot seats in the Lockheed C-141. But the US Airways crew wasn't as garrulous. I packed a lot of electronics to entertain me on the journey and realise now that I have to revert to a dedicated MP3 player to ensure I have at least 20% power on my phone after an eight hour stint in my seat. THERE ARE CUTE buttons you can push on Dublin Airport survey kiosks located at the halfway point of departures to Stateside destinations. There is a reason for placing the things ahead of the preclearance scrum. The Dublin preclearance procedure for US passengers is thorough and repetitive. The triple-checking probably serves a purpose but it is still relatively easy to circumvent if you pay for a quick queue and sit in a wheelchair. But if you have two pre-teens in tow, the proceedings could become arduous. I used to fly sensitive cargo into cloaked destinations. In my jaded eye, a lot of what the flying sheep think can prevent terrorism feels like security theatre to me. 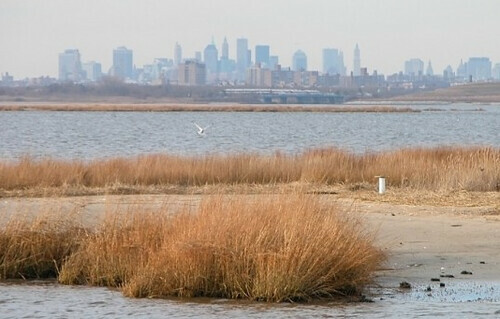 Photo by InHabitat.com of Jamaica Bay. I'M SHARING THIS AMERICAN LIFE stories with my Media Writing students by bringing the story of the Brooklyn Archipelago into our Clonmel campus. Many of our Irish students have seen or flown over Ruffle Bar but I doubt that they have heard the story of Alex and his friends as explained in the accompanying audio clip from This American Life. The crazy story of friends adrift in Jamaica Bay folds nicely into discussions we're having about the monomyth. It's very easy to map all 17 stages of the hero's journey against the Brooklyn Archipelago story from episode 307 of This American Life. 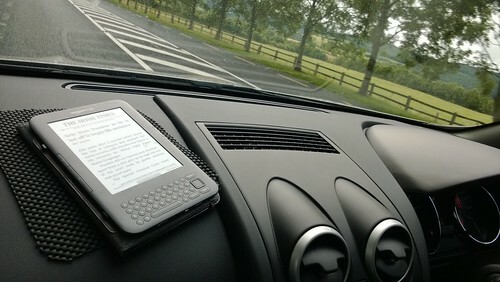 Kindle snapped on the Qashqai Dashboard. IN MY PERFECT world, there are NFC chips integral to the text-to-speech and MP3 functions on my Kindle AND NFC on the dashboard of our car so we can hear Kindle read news and audio books to us. Since Jeff Bezos reads my blog, I hope to see this offered by Christmas 2013. In the meantime, you can follow my adventures as @topgold down Irish boreens. And if you're a real friend, feel free to drop an NFC enabled HD audio device into my Christmas stocking. Mia Goldbach with Bus Eireann. I TOOK OUR five year old daughter on a half day bus journey that resulted in her bringing a birthday present to her six year old cousin. Along the way, I think she started to enjoy inter-city travel by Bus Eireann. We have watched the big red buses pass through Cashel through the years and now they are the only long-range travel option transiting the town. Aircoach ceased operations in June 2012 as the State subvention for private operators was dramatically reduced. Because our bus services are cut in half, I cannot use a Cashel Bus stop to get to Dublin for a morning meeting. That limitation has totally eliminated my ability to attend Dublin events that start in the morning. But there is no morning agenda awaiting Mia so we took the earliest bus from Cashel at 0925 and rolled into Drogheda before 2PM. Along the way, Mia played Hair Salon, sketched in a monster's magazine and talked to me about animals in fields. All things considered, it was a fun trio. Photo from Adventureland. Wifi from Bournemouth Airport. I FLATTENED MY over-the-air data allowance after a week in England and that meant poring over brochures for travel information. I plan to write and talk later about how I switched off the information normally dripping into my phone but for now I'm fascinated how we made our way around with paper brochures and signage. One excursion led to an afternoon with the White Rabbit (in the photo). The most significant thing for me is the realisation that we culled plans from three sources. The grandparents favoured the brochures. Their grandchildren often had picked up inside information from fellow holiday makers their age out in the meadow. And I preferred sneaking a peek at TripAdvisor, Foursquare and BestOfDorset when I had a WiFi signal. On the day we found an Adventureland, we also found free access to the aircraft museum across the parking lot. And everyone left happy. I MARK MAJOR events and this week it is young Dylan's progression with big furry animals. He's pictured below and he suddenly wants to meet and greet them. He was helped along this path by the ambiance of British pubs. 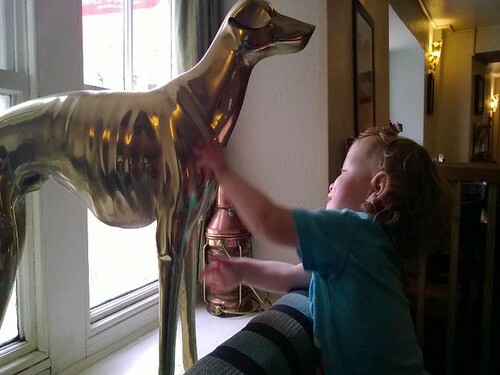 Most of the child-friendly places we visit in the south of England also accommodate dogs as well. So where we brought our two youngsters, some locals brought their three dogs. And that sometimes resulted in friendly greetings for all concerned. The only downside of this new-found confidence is knowing that dog ownership is probably not far behind. 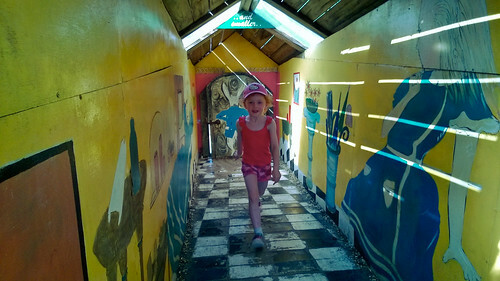 Mia in the stocks of Corfe Castle, captured by Lumia 925. WE SPENT SEVERAL HOURS inside Corfe Castle, one of Britain's most iconic and evocative survivors of the English Civil War. The hands-on activities around the castle could provide ideas for the caretakers of our own Rock of Cashel, the bit of history on our own doorstep. Corfe Castle was partially demolished in 1646 by Oliver Cromwell, engaged by the Parliamentarians. Cromwell's work is well known by local families who survived his pillaging when he visited our lovely market town of Cashel. I RECKON I COULD SPEND 20 euro a day snapping photos on holiday. That's based on each image weighing 2 MB and my phone backing up an average amount of photos to my cloud services. 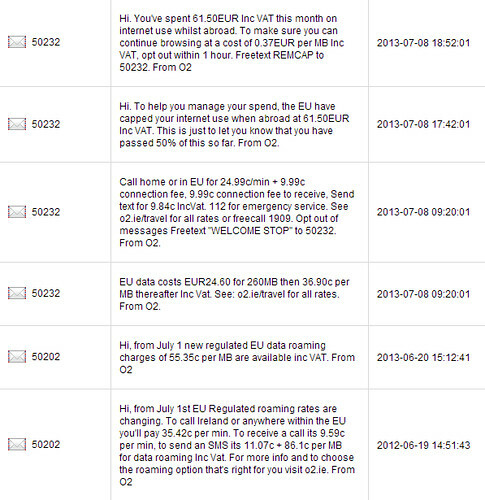 During a two week holiday when you don't control how your phone backs up your images, you could return home and discover you owe your mobile network more than 140 euro just for backing up your photos over the air.